These past couple of months have been pretty great when it comes to credit card offers from American Express. So great in fact, that I pretty much don’t feel comfortable applying for anymore of their cards. In the past few months alone my wife and I have picked up a ridiculous amount of points. By now I’m sure you heard of the 100K Platinum and 75K Biz Gold offers that came and went. (Some people are still having success getting the 75K Biz Gold offer to show.) There are also of course the SPG 30K offers that are good until Monday as well. Now we have two more great offers that are fairly easy to replicate. Lets take a look. The American Express Everyday card is fantastic for a couple of reasons. First off, it is the only no annual fee card that earns Membership Rewards points. This means you can keep all of your Membership Rewards points alive if you don’t want to get a more expensive card like the PRG or Platinum. Of course the other reason a card like this could be very valuable is Amex Offers and Small Business Saturday. Since you won’t ever have an annual fee, this card and authorized user cards could be worth big bucks in the long term. Now there is a very nice bonus as well. Lets take a look. 2X points at supermarkets on up to $6,000 in purchases per year. 20% more points when you use your card 20 or more times in a billing period. Earn 25,000 Membership Rewards points after you spend $2K during the first 3 months. While 25,000 points may not seem like a lot, the normal offer on this card is only 10,000 points. Remember this card has no annual fee and unlocks Amex Offers and gives you the ability to keep all of your Membership Rewards points alive without having to pay a premium like with the other cards. The offer is available directly on the Amex website at this link. You must visit in private or incognito mode to get it to show up. Sometimes it may require you to try different browsers, etc. I was able to get it to come up somewhat regularly in Chrome incognito. The Blue Cash Everyday is another very good card because it has somewhat decent earnings and doesn’t carry an annual fee. I do think the Everyday offer is better overall, however I know this card may be of use for some. Considering the normal bonus is only $100, this represents a significant increase. 3% back at supermarkets on up to $6,000 per year in purchases. 2% back at U.S. gas stations. 2% back at select U.S. department stores. Earn $250 after you spend $1K during the first 3 months. As I said before, this is a good card mainly because of its lack of an annual fee and the increased bonus. The 3% back at grocery stores is nice, however it is capped and there are better cards for that like the Old Amex Blue. Still, this bonus represents a significant increase over the normal $100, so it will be worth considering for some. Both of these offers are very good and may be useful for someone looking to pickup a no annual fee card in preparation for Small Business Saturday and all of the end of year Amex Offers we normally see. If I had to choose one of these deals it would be the Everyday card. The ability to earn Membership Rewards combined with this highest ever bonus and no annual fee is really compelling. Previous articleHyatt Just Sent Me an Awesome Gift for my Loyalty. I Can’t Wait for the Next One! For me personally the Blue Cash is the better card, although I know my opinion is not in the majority between the two options. Our travel value is best maximized with hotel chains, not flights, therefore Amex points aren’t as valuable to me. Also, comparatively speaking, the BC is 1% higher in grocery stores than the EC. One other thing about caps and card limitations. The OBC you referenced is a solid choice for those who put in volume at grocery stores, although there’s two caveats people should know about if contemplating between the BC and OBC (both cash back cards). OBC is 1% cb on the first $6,000 grocery spend and has a $50,000/year (statement period?) cap on the 5%. Obviously the OBC favors the heavy hitter, whereas the BC favors the average spender who isn’t looking to go out of their way to generate a lot of MS through grocery stores and gets the 3% upfront. I picked up the BC and added it to the wallet containing it’s older brother the Blue Cash Preferred with an effective 4.8% grocery cb on the first $6,000 after the annual fee is considered. Both cards are mainly used for buying gift card deals and obviously amex offers as well. I use my two Sallie Mae cards (wife and I) for main shopping with 5% cb on $250/statement period and my Target Debit RedCard for 5% discount in store. Very good insight and analysis Anthony. Thanks as always for sharing. This is great. Thanks for the write up. Hey anthonyjh21, thanks for the strategy for thought. Im curious what you mean by “Our travel value is best maximized with hotel chains, not flights”. Do you mean thats your personal travel preference based on your logistics? Do you typically drive instead of fly or only travel local? I ask because while MR points is arguably best maximized via x% bonus transfer points to airline partners, there are still some hotel transfers that I thought were solid like Hilton (1:1.5) Best Western (1:1) Choice Privileges (1:1). But since you value CB and hotel chains more then I guess it doesnt matter. BC and BCP are fixed rate cash back, but EC and ECP have 20%-50% bonus after certain number of purchases combined with transfer bonus and awesome redemption, maybe you will score over the BC 1% higher in grocery stores. I guess its all depends how you redeem and how you value the points which is super subjective. We travel locally, although I’m hoping to change that more so now that we have a 1 year old little girl. I know she wants her to see the world and shes much less averse to discussing flying again. It’s not like my wife hasn’t been on a plane either; she’s been across the U.S. and to Hawaii several times. I definitely need to look more into the value of Amex points and transferring to hotels. I admit I haven’t spent much time looking into it, but from the little research I did, none of them were anywhere close to Hyatt and transferring UR points. That said, I think the Best Western is actually good value. Example: We wanted to go visit friends up in Chico (in California for others who don’t know) and there are no Hyatt hotels but there is a Best Western. This could be a good redemption value. Seems it’s best to have your options open and points available across all programs. Exactly. Definitely agree with you man. Gotta always have options, but I agree that Hyatt and UR is a tough combo to beat based on your preference. Better take your trips now bro. When your daughter grows up, you + wife will feel it man!! Oh ya, in case you cared about the MR to Best Western transfer, I believe that will no longer be an option after December 31st, 2015. Need to check though. Does every article by boardingarea bloggers need a “bottom line” or a “conclusion” – are we in highshcool still? And I think most of them are just cut and paste like “I love amex offers, they are great savings”. Sorry, love the blog but getting tired of the monotonous conclusions everytime. This has been my style of writing going back several years. (Since before this blog was on BoardingArea.) Many people just skim the content, so it makes it easier for them to see the bottom line. I can assure you that I don’t cut and paste anything, but I can see your point. It is definitely not my intention to talk down to everyone. Thanks for the feedback! Goes to show you can’t please everyone. I’d of never thought anyone would have a gripe with a CLIFFS type overview of a story. I can’t tell you how many times I’ve went straight to that section to get a quick overview of what the story was about because, frankly, I didn’t have the time to sit down and read it uninterrupted. One of the pluses of having children I suppose. Perhaps in your situation you have more time to sip your coffee, twiddle your toes and read in great detail every story you come across. I’d bet however many people do not. It’s why I only follow a few bloggers and trust in their opinions (and conclusions/verdict) when I don’t have a lot of time (or concern) to find out for myself. I don’t know who or how many bloggers you follow, but maybe you could weed out some fluff. Shawn here covers almost every deal that can be found (several posts a day). One plus in your situation is you can probably just scroll down just before the conclusion and hide it from your view so it you don’t get overly tired and save your eyes of the monotony. CLIFFS: Can’t make everyone happy. Close your eyes when you get to the end to avoid high school material. Its just a blog style. Focus more on the content man. Besides, at least Shawn doesnt put on the very top “OBJECTIVE” and begins his paragraph. You know how many resumes I see with an “OBJECTIVE” and going over two three pages? Laughable. You know what I am really tired of? The damn intrusive ad hack browser hijack making you think you have a virus and want you to call their “technical support”. I seriously hope NOBODY got phished or scammed from that. Dang! I literally just got the Everyday card last week. What kind of record does Amex have with matching sign up offers when you have just very recently applied? I know I’ve gotten Chase to do it before, but not sure about Amex. 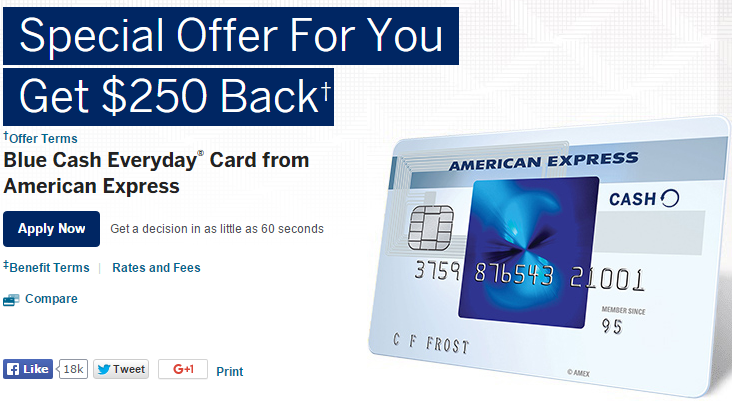 Also, does Amex have a referral bonus for their cards? And can you freely transfer membership reward pints between spouses? They usually won’t match, but you can ask. You cannot transfer Membership Rewards points to another person, but you can transfer the points out to a loyalty account of any authorized user including a spouse. Some cards have a referral bonus like the SPG and Delta cards, but I don’t believe the Everyday card has one. Yes, huge waste of time in trying to get them to match the offer! What’s up with that? It seems that Chase and Citi do this frequently and with no issues! And, I did discover you can refer a person to the Everyday card but the offer they get will be the 10,000 points offer and you will get 5,000 for referring. I was thinking to refer my husband and at least get the 5,000 and he would get the 25,000–but sadly it won’t work! Perhaps I’m just unlucky but I had three unsuccessful attempts at the Citi 60k match on the link made public a week or two ago. I’ve tried three times and no luck. I’m going to call again and ask to speak to a supervisor for one reason only – they are giving the extra 10k to some and not to others. I’m absolutely 100% ok with them not matching me as long as it’s a universal rule across the board. Furthermore, if they want to tell me they won’t honor it because I don’t have any banking history with them then ok no problem. The letter they sent me informed me that they “do not honor links to special offers that have been obtained through third party websites, blogs or forums.” Well, this obviously is not true and therein lies my issue with Citi at this point, as their reason for not matching has nothing to do with my relationship with Citi. I’m assuming she wasn’t able to make any matching offer because as everyone knows the link was eventually pulled, but who knows. As she went on, she was kind of walking the line and basically implying that whomever I spoke with over the phone didn’t notate my account properly and that she would “fill my account with notes for me” so that the Senior Manager had accurate information to work with. Soooo, a Senior Manager will call me in the next 24-48 hours. To be continued…. Hey Anthony. Keep us posted, because I ran into the exact same issue minus your Senior Mgr part. Basically declined three times after I called and PMed. So I just gave up. Its fine. YMMV obviously because plenty of people got it. Good for them. Will do. I *should* get a call by the end of tomorrow. So I have a couple of data points worth mentioning. I applied for two Amex cards in the same day (9/11) and (eventually) was approved for both. The Simply Cash business card (first application) was instantly approved and the BC went into pending status. I called the number and they told me it was pending verification and that they’d note that I called in and requested approval. Just a few minutes ago the email of approval for the second card came through so I’m happy about that. Second data point is in regards to the Citi 60,000 point matching offer. Long story short, a (friendly) senior manager told me she’d go ahead and give me the extra 10,000 points. The only catch being that I had to hit $3,500 before the system would allow her to add it. I was at $3,200ish and as of today I crossed the $3,500 threshold. She told me she”ll check in every few days and once the $3,500 is met she’ll manually add the points and that nothing else is required on my end. Still waiting on the points but the good news is that eventually they approved me for 10,000 additional points. Dude Anthonyjh21. Thats so awesome man!! Glad you got the extra 10k! Now I am gonna try again! Jealous! As for the 2 AMEX, did you do one personal and one business? sounds like you did, but wanted to make sure because if you applied for both personal and got approved, thats awesome and a great data point. Always thought it was one Amex CC max approval per day. Either way, great you got both. Yeah I did one business cc (Simply Cash) and one personal (Blue Cash). I read a few data points on DoC regarding the ability to get two Amex in one day which is what ultimately led me to give it a try. They said when you call just request approval for one card at a time. Hang up and rinse and repeat. It did take 5 days to get the 2nd card approved but in the end it worked out exactly as I had hoped it would. fyi, i just got a 100k offer last night on the amex plat using the pre-approval @ americanexpress.com. approved 5min after I initially got the ‘technical’ difficult message. I can’t comment on transferring points but everything I’ve read suggests Amex will not match you to a higher sign up bonus and that it’ll ultimately result in a waste of time. Thanks Shawn for the heads up, was just thinking ahead about this card to roll our EDP points into so this is perfect timing. I can’t comment on the use of the card or,anything like that but I will learn and I will get this down pat . Thanks Shawn for the great Blog. I’ve been reading for months but have not commented before. Since I jumped on both the incognito Amex PRG in April and the incognito Amex Platinum in two weeks ago, I wanted a way to extend the life of my MRP forever, since I will cancel those. I just snagged the incognito 25k everyday offer and got instant approval. Few notes: my wife loved the chance to grab some Jimmy Choo’s at Saks and got the Amex offer for 6k more MRP. Spendy, but she grabbed some Michael Kors and the Choo’s at extreme discount clearance + sale coupon + 6k MRP + discount on another purchase before 10/31. See! we are learning to maximize after all. My plans to maximize MRP are most likely with Delta on Virgin Atlantic non-stop from West coast to London. Availability is good. Backup plan, availability from Portland to AMS on Delta’s daily 767-300 is wide open in business saver tier 1 awards. Also, it is possible to connect AMS to LGW via Garuda Indonesia 777-300ER 3x weekly which is also wide open. Thanks again, keep up the great work on this site! Awesome job at Saks! Thanks for the kind words. Do you need to choose between the 2, or can you apply for both? They’ll allow a maximum of one credit card application per day, but dont know on the limit on charge cards. Also keep in mind that in general you can’t have more than four charge cards and four credit cards at a given time (spread across BOTH business and personal cards). FlyTalk has many people note being approved for more cards than that, but YMMV. First off, your headline is about the benefits of OBTAINING the cards, not necessarily keeping and using them. I would bet that most of your readers will “sock drawer” these cards if they are smart—there are always other spend bonuses to meet with new cards, cards with better bonuses, and better cards for MS. 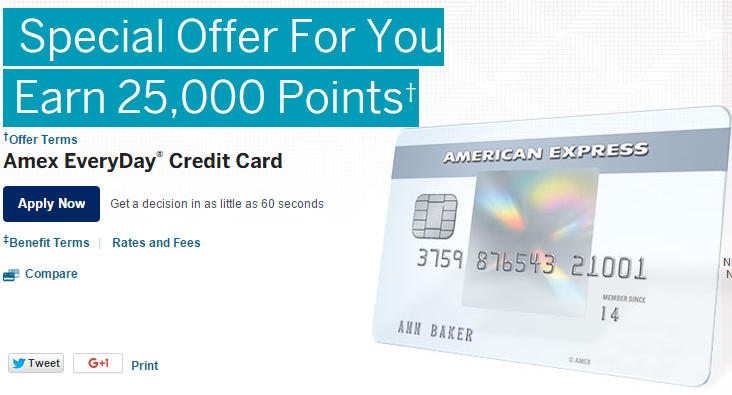 These are good cards for AMEX specials and for building credit history, but not much more. That said, why shouldn’t people get both? Like you wrote, their offers are both at all time highs. I will let Shawn speak for himself, but I will comment as your peer from a reader perspective. I am not sure why you are confused by his final sentence. Hes pretty clear about what he values and outlines the benefits of each card and why he would get one over the other. Its up to the reader to do his/her own research and incorporate the two cards if necessary based on this info. What part is not clear? Even his blog title is “Two New ‘Best Ever’ Offers from American Express”. Meaning, he is introducing TWO NEW OFFERS to his readers. So I guess its true that the “headline is about the benefits of OBTAINING the cards, not necessarily keeping and using them”. But he does clearly detail out why someone may want to keep using either card. So your comment actually confused me. Not sure what your point is. Are you saying you disagree? That you shouldnt get either card if you had a choice? Yes, there are always other spend bonuses to meet with new cards, cards with better bonuses, and better cards for MS, but it really depends on your overall strategy and what you have done until this point. No matter though, youre entitled to your own thoughts and youre not hurting anybody so no issue really. However, you assumed that “readers will “sock drawer” these cards if they are smart.” Im not so sure man. These cards are very nice depending on your strategy. Maybe some will put it in a sock, maybe some wont. What if a reader never had any AMEX to begin with and they actually dont want the SPG promo or the AMEX Plat/Gold? This would be a good one maybe for them w/ no annual fee. These are not the strongest AMEX cards, I agree with you there, but again, everything TOTALLY DEPENDS ON YOUR STRATEGY. Of course, if you have no strategy then good luck to you in general. So you ask why shouldn’t people get both? Yeah you could but also keep in mind that in general you can’t have more than four charge cards and four credit cards at a given time (spread across BOTH business and personal cards). FlyTalk has many people note being approved for more cards than that, but YMMV. Also, AMEX will allow a maximum of one credit card application per day, but dont know on the limit on charge cards. So you cant get both same day anyway. Maybe one after another if you really wanted both. Then finally, your request for the TOP reason to get a Everyday card: I think the true answer is “IT DEPENDS”. However, Shawn already laid it out from his perspective and you had mentioned that your Gold or Plat card is coming up for renewal and you dont want to pay it so this card will offer you a way to keep your eaarned MR points alive. Thats valid too. I think you already have your answers there. Or someone elses TOP reason could be because they simply want the 25,000 Membership Rewards points. Why cant that be the TOP reason? So I think everything you need is laid out for you man. I was just trying to share my opinion if someone was only thinking of getting one or the other. Of course if both offers stick around then it could be possible to get both of them. Keep in mind that it isn’t generally possible to get two credit cards in one day, although you can get a credit and a charge card. Thanks, Shawn. I guess if it were me I would recommend to people to get card A on day 1 and card B on day 2. Is there some insight that the deals will go away tomorrow and you must pick only one? Like CSP is to transfer UR, what are my options to transfer MR?